In the last two centuries, manufactured housing components have evolved slowly. From a church built in Dearborn, Illinois, in 1833, which used factory cut dimensional lumber, until today, stick framing has changed very little. Stick framing still dominates the light construction market because building energy performance standards remain low, it is easy to work with, low in cost, and extremely adaptable. However, no longer do we have cheap energy, vast forests, primitive manufacturing and a lack of concern for environmental issues. Today’s manufacturing is taking place with computer aided design, CNC fabrication, plastics, adhesives, engineered wood, modern machinery and a renewed respect for the environment. By keeping some of the best aspects of stick construction and combining these with the newest methods and materials, a hybrid of stick-construction has evolved, and it is called Structural Insulated Panels, or SIPs. 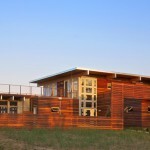 With SIPs, insulation is a forethought, not an afterthought. Most homes built before 1950 had almost no insulation. When energy became more expensive, insulation was added to stick-built structures by inserting something between the studs and rafters. With SIPs, a foam plastic insulating core and engineered wood faces work together to make large rigid panels that are the frame, sheathing, and insulation of a structure. An all-in-one product, SIPs provide huge energy savings of up to 50% or more, when compared to traditional stick framing. In the past, factory-built housing was nothing more than a transferring of job site building practices into a factory setting. Workers would cut the lumber and assemble the walls and roof using the same tools and methods that they would have used in the field. This is not the case with SIPs. SIPs utilize a highly sophisticated manufacturing system. SIPs are not just rectangular laminated panels, but panels that have been fully engineered, independently tested, and pre-cut to size and shape to eliminate as much field work as possible. The US Department of Housing and Urban development (HUD) and the Partnership for Advancing Technology in Housing (PATH) worked together to produce a report in 2002. It is interesting to note their vision in 2002 of what should happen to construction by 2008. “The vision for Advanced Panelized Construction is to develop common building panels that perform multiple functions and integrate multiple tasks using non-specific material specifications that deliver consistent levels or grades of performance from basic to high performance, and are easy to order, deliver, assemble, and integrate with the building process. Ideally, the building panel achieves lower in-place cost (i.e., materials, labor, and overhead) than the individual pieces and individual tasks it replaces or integrates. The vision applies and extends to small builders, high-volume production builders, and manufactured home producers. It brings progress and contributions to each of the HUD/PATH goals via lower in-place cost, increased energy efficiency and durability, and safer means to construct the building envelope” (PATH Technology Road Map: Advanced Panelized Construction Year One Progress Report, 2002, p. 2). HUD/PATH’s vision is no longer a dream. It is a reality with SIPs. Before 1980, plywood foam core panels were limited in size to 4’ x 8’ or 4’ x 10’. In the early 1980s, when Weyerhaeuser introduced 8’ x 24’ sheets of 7/16” thick OSB (Oriented Strand Board), jumbo SIPs were born. Looking back, large panel introduction did not seem revolutionary at the time. It took some time for the small sandwich panel manufacturers to grasp what opportunities had been laid before them and what obstacles had to be overcome to make this a revolutionary change in construction. One major step in promoting SIPs and making it an industry occurred in 1990 when ten small “sandwich panel” manufacturers gathered to discuss issues involving this new large OSB panel system. It was determined that they had to have another name for the product rather than “sandwich panel”. After productive discussion, one of the manufacturers suggested “Structural Insulated Panels”. The name stuck and this group moved ahead to form a trade organization, the “Structural Insulated Panel Association” (SIPA). Bill Porter, founder of Porter Corp, was instrumental in organizing the SIPA organization. Once this group formed, SIPs became known as the most advanced building system available to the light construction market. Through the work of SIPA, many great organizations and researchers came forward to help refine and develop the SIP building system. With energy saving studies and documentation from the US Department of Energy’s Oak Ridge National Laboratory, SIPs were established as the best commercially available method to build an insulated envelope and save on heating and cooling costs. specific CAD software. This software converts building plans directly to CNC machines which can quickly cut panels with amazing precision. After the CNC-cut SIPs are delivered to the job site, they can be assembled in hours or days instead of weeks. The time study publishing company, RSMeans, indicates that construction with SIPs can save 55% of erection time compared to stick construction. SIPs’ capability to span 20 feet for a roof panel or carry an axial load for a three story building are factors that allow designers to simplify structures with larger panels. The reality of saving heating and cooling energy of up to 50% or more with SIPs is driving the SIP market today. Not only has SIP construction held up in a down market, it has increased market share. Despite four years of a declining U.S. housing market, the structural insulated panel (SIP) industry has avoided the full force of the economic recession, according to a recent survey conducted by the Structural Insulated Panel Association (SIPA). Results indicate that the industry experienced a modest 12 percent decrease in residential production volume in 2009, compared to a 28 percent drop in U.S. single family housing starts over the same time period. HUD/PATH’s vision of advanced panelized construction is now a reality that is changing construction in the 21st century.